just as joseph learned about mary in making the movie, mary learned something about joseph. i had never visited him on campus. it’s the sort of thing a mom is supposed to do–go to parent’s weekend or at least pick him up from campus in june or drop him off at the dorms in september. i felt ashamed and so i was great at coming up with excuses but bluntly, i was too scared. so mary gave me a gift two years after joseph’s graduation: a college tour. she showed me the dorm where he lived, the sandwich shop where he would get his late night snacks, the classrooms and the student union. then i saw a church. and i pulled out my camera. we were such fast friends that we were making something we thought was funny! of course, later that night, when i had taken the four/five hour train from boston to new york, joseph said “mom, i actually did go to church every week for at least the first two years of college”. . . . i felt like a jerk. i share a lot with mary: we’re both mothers, we’re both rotarians, we both have hit the glorious age of fifty (although it’s a little more fresh for me). she has done amazing things with her life in the face of medical adversity. i want to be the positive woman that she is! maybe in my new years eve project, she’s f2fb friend #168, but she is truly a friend not just on facebook! onward to new york, to see facebook friend steve ware. i haven’t seen him in ten years and i am a little nervous because he works on the hit show jerseylicious. i hope to persuade him that i would make a great addition to the cast. 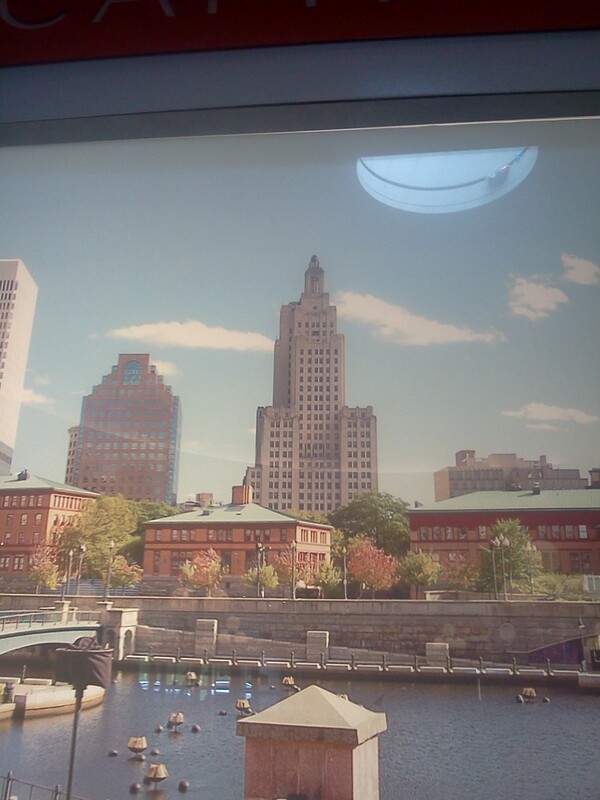 before i left rhode island, i was reminded of my cousin meg showing me this picture in the train station. she said it was the building over which superman flew in the christopher reeve movie. she and her husband call it the doopyman building, not because they can’t pronounce the word superman but because my oldest son joseph couldn’t pronounce the world. superman ice cream–a mix of cherry, blue raspberry and orange, was his favorite–or doopyman ice cream was his favorite when he was four years old. This entry was posted on Sunday, July 10th, 2011 at 11:46 am	and tagged with boston marathon, f2fb, facebook, friendship, mary mcmanus, post polio syndrome, superman and posted in Uncategorized. You can follow any responses to this entry through the RSS 2.0 feed.